Guest blogger Danny Elliot writes about his visit to one of Entelechy’s 21st Century Tea Dances earlier in this year. This article was originally published on Age UK London’s blog. Please visit http://www.ageuklondonblog.org.uk for more quality blogs on the age sector, including older people and the arts. Earlier this year, I was invited to go to ‘Iced Tea: Chill Pill meets a 21st Century Tea Dance’, a special edition of the Tea Dance featuring Chill Pill, a group of spoken word artists. The Albany is a terrific venue, looking at their website, hosts a wide range of events for older people. You can have lunch in the ‘caff’, who use produce grown in the garden which is tended by some of the older centre users. It seemed to be a real hub of the community. This particular event certainly did that. Spitz Music provided incredible jazz musicians who performed throughout the afternoon. I won’t go into too much detail about their story, as we’re hoping to have a blog form them in the near future. Suffice to say, the musicians were expert – though that sounds too clinical. They could play anything, and did, changing the mood of the room, and changing to the mood of the room. Chill Pill also performed – several poets did sets which were thought provoking. I have a friend who is a regional slam poetry champion, and have great respect for the medium – half way between classic poetry and rap, Chill Pill also gave flawless performances, enhanced by backing from the jazz musicians. Despite the excellent performances (and I do really admire the fact that this Tea Dance attracts such incredible talent – older people deserve the best) the stars of the show were the older people themselves. They were involved in everything that was happening, either as writers, performers or directors. 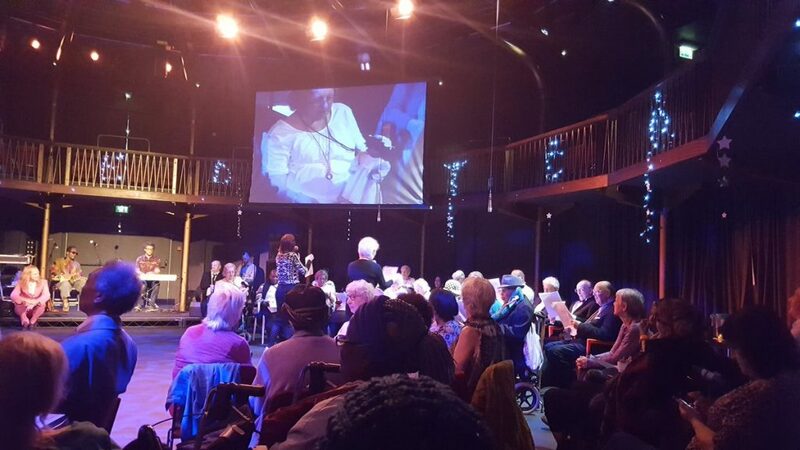 ‘Meet me at The Albany’, an older people’s group linked with the Theatre, had been to Deptford Market and filmed market traders talk about their first experiences of love. The film was screened for us and was fantastic – you felt those being interviewed opened up to an older interviewer more than they would have done to someone younger. One of the Chill Pill performers wrote a poem called ‘Blank Cheque’ while she ate lunch with some of the older people before the dance. She had asked them what they would do if they were given a ‘blank cheque’ (a reference to a newspaper article that day) and wrote a poem inspired by their answers. The poem was inspiring partly because it was so good, partly because it had been written so quickly, and partly because each of the older people had expressed incredibly generous attitudes as they spoke – every one of them wanted to use the ‘blank cheque’ for someone else, or for the greater good of society. The most moving part of the afternoon came when the audience were asked to recite a ‘half-remembered poem’ and were told that ‘the less-remembered the better’! One older lady recited a poem she had learnt as a child in the Caribbean for a school inspection. She got a few lines in, and stopped; she said she couldn’t remember. ‘That’s fine’, the MC said, ‘but try again… maybe another run up to it will unlock the memory?’ She started again, and she got through the whole thing. You could see her mind transport her back to a sunny, warm climate, a more innocent time, a younger body – and it was so incredibly emotional, we all stood and cheered. Another lady quoted a few lines of a poem that were also the last words her father had ever said to her. Someone else quoted a stanza from ‘If’ by Rudyard Kipling. We all laughed, a perfect release after the emotion of the other poems. And then there was the dancing! The dance floor was packed. People danced in their seats. People danced in pairs, and in threes. People swung each other round. One older lady danced with her zimmer frame, and I counted seven wheelchairs on the dancefloor at one point – it was beautiful, all backed by the best live music I’ve heard in a long time. I had been invited by Kurban Haji, who I first met over four years ago. Kurban is the life and soul of most parties, and he didn’t disappoint here. He was in the choir at this tea dance, and is hugely appreciative of all that the staff and volunteers do to put on such a show for older people – but the fact that he gets to be involved himself is of greatest benefit to him. I agree, and the 21st Century Tea Dance was a great example of just that.